For years, people debated the value of social media actions. Is a like worth anything? Does your subscriber count really mean anything? In the last few years, Facebook and Instagram have developed business tools that have armed brands with the means to monetize their audiences and make that debate obsolete. And yet, despite these advancements, many brands aren’t connecting their social actions with business results. Here’s a great example: Instagram contests. The thing is, most brands focus on #1 and #2, but stop short of #3. There’s a reason for this gap. But there’s also a tool that can solve that problem and shift a brand’s Instagram contest into part of a smart sales strategy. But before we deal with that evolution, let’s cover the basics. If you’re interested in running an Instagram contest, you should start with Instagram’s rules. Whether it’s for brand exposure, increasing your followers, or making sales, make your goal SMART (Specific, Measurable, Attainable, Relevant, and Timely). The goal you choose for your campaign will dictate the strategy you need to meet it. For example, if you want to build a massive list of followers, you’ll need a prize that appeals to a wide range of people. But if you’re after sales, you’ll probably want to build a more targeted, engaged list that’s primed to buy your products. We’ll get into deeper strategy later in this article. For now, though, try to define singular goals and then focus your efforts around the metrics that match those goals. You’ve got several options when it comes to how people can enter your Instagram contest. Contestants can enter by taking a variety of actions on your page or posts. Those actions simple, like liking a brand’s post. Or, you can make them more complex, like needing a sale or tagging friends who also like the post. The general rule of thumb is that the simpler the entry method, the more entrants you’ll get. Add steps and you’ll begin to filter for more interested people. The most common method is to create a hashtag that matches your brand and the competition. Contestants enter by tagging their own posts with the same hashtag – simple! If you choose to use a hashtag for your contest, make sure it’s a branded hashtag. If you use a term that’s too general, like #competition or #giveaway, you’ll end up attracting a lot of irrelevant traffic. #competition, for example, is used in 8.6 million posts, while #competitionbikini is used in only 92,500 posts. Again, your goals are important; if you’re chasing reach, use the general term. But if you’re interested in impact, be specific. Keep in mind that hashtags have slightly different effects on different platforms. According to ShortStack, the optimal number of hashtags on Facebook and Twitter posts is just two. On Instagram, though, the more hashtags the better! 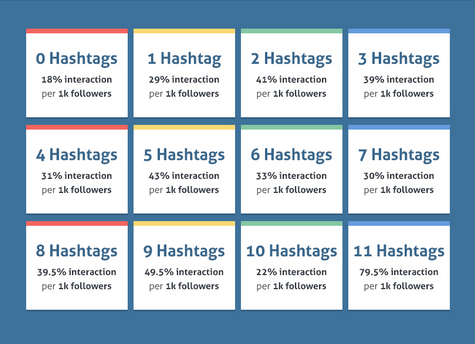 You are limited to a maximum of 30 hashtags on your post, and according to QuickSprout you should be making use of at least 11 of them. Your contest absolutely must have great visuals. Remember, this is Instagram! So what makes up a great image/video? While your contest can be made up of a gallery of related image posts, you need to start with a clear layout. The goal is to immediately attract and engage members of your target audience. Think about the basics of what works with online content. You want your traffic to be engaged, entertained, and excited to join. The more you can drive those three feelings in your followers, the better your contest will do. While your image gets most the attention, don’t underestimate the importance of your caption. Your caption should repeat the same main points as the rest of your campaign: how to enter, where to enter, a prize description, and how to win. Don’t be afraid to use emojis in your caption. Remember, the point of the caption is to quickly and concisely communicate the parameters of your contest. Emojis help because they spruce up an otherwise bland block of text. They’re visually appealing and often funny, which gives you a chance to add some personality to your brand. Whatever the reason, emojis significantly increase engagement rates. Remember, the emphasis here is on grabbing attention and quickly communicating with your audience in an engaging manner. Again, let’s go back to the goals of the contest. Your prize needs to attract the right kind of contestants. If you’re looking for mass engagement, choose a prize with broad appeal. Vouchers and gift cards work great for pretty much everyone. If you’d like to develop a more targeted following, choose a prize that’s relevant to your brand and your audience. Can you offer your own products as prizes? What about rewards that complement your products? You may also want to consider using multiple prizes. Think about it – if you run a contest with only one prize and thousands of people participate, the competition may feel unwinnable and people may feel discouraged from entering. You can combat this by offering multiple prizes. Instead of just one prize, can you select a range of products to reward a number of winners? You’ll likely engage more people and keep the contest interesting even as more people enter and winning odds per person drops. You can also play around with the frequency of your giveaways. Think about how a contestant participates with your content. They hear about the contest, enter via hashtag, and then wait for a winner to be announced….then what? By running regular, smaller giveaways, you can keep an audience engaged more consistently and for a longer period of time. You can even choose to run a major contest every so often, while still committing to a more regular weekly or monthly minor contest. Your prize strategy can be as simple or complex as you want to make it. Just remember that your prize should relate to your brand and that it should be something your audience actually wants. If you have a loyal following that already knows and loves you, that’s great. But your Instagram contest’s goal is to grow your business – either in the form of more followers or more revenue. Trust depends on several elements, but it starts with clarity and brand consistency. Think about your audience, your brand identity, and the prize. You can earn the trust of your community by engaging heavily with comments and questions on your contest’s post. The more engaged your brand appears, the more conversions you’ll have. You can go even further by featuring other trust markers, like overall review scores. Here’s a Google review score from my local cafe. They’d do well to highlight their high score in future Instagram campaigns, including contests. 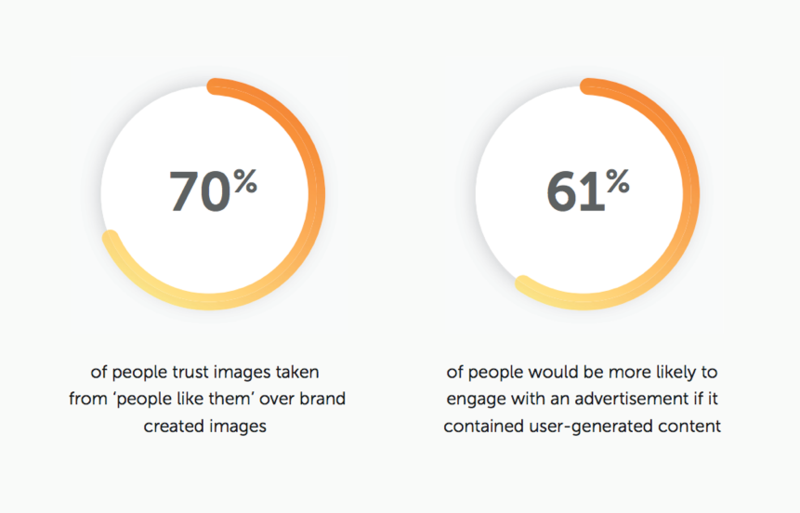 User Generated Content, or UGC, is simply the content that your audience creates while supporting your brand. You can require UGC-based entries by asking contestants to tag a relevant image post with your branded hashtag. This turns a visual post into an almost automatic submission, while simultaneously featuring a positive review. User-generated content works great as a creative contest entry, but it can also be valuable in the long term. Most UGC can be upcycled into content for your brand’s blog, case studies, or even feature stories and more direct testimonials. Instead of choosing the winner yourself, you can leverage public opinion by enabling voting. Voting also provides a creative way to boost engagement and organic reach across social platforms. By allowing contestants and non-contestants alike to vote for their favorite entries, you don’t have to worry about rating entries against some internal metrics. Instead, let the internet decide for you. Particularly motivated entrants will turn into promoters as they share their entries’ links and directly ask their friends for their support in the form of votes. Good engagement numbers and growing vote counts may also add to the excitement of the contest and encourage onlookers to jump in and participate. Enabling voting will encourage people to ask their friends and extended networks for votes. That’s a great start, but it’s limited to how enthusiastic your contestants are. A wide-open vote might make the contest feel unwinnable – after all, there always seems to be someone a little more intense out there. Think about contestants who arrive a little late to the party. If you’re running the contest for a month and a few leaders have already built up thousands of votes for their entries…what does that do for potential entrants in Week 3 or 4 of the contest? Should they even both entering if they don’t think they can catch up? If you structure your Instagram contest as more of a raffle than a vote, you can ask for specific actions in return for more entries – and a higher chance of winning. Let’s say an initial entry action is awarded one vote, but optional social shares are each worth an additional 5 votes. By taking a minute to share the contest on Facebook and Twitter, the entrant is 11 times more likely to win. It’s a no brainer for both the contestant and for you. You can get even more specific by requiring entrants to like your contest’s contest post, tag a friend, and have the friend also like the post. On the surface, it’s a requirement that will drive away less interested people and possibly increase your overall likes count. What you’re really doing, though, is asking your entrants to choose a friend who’s likely to follow through with the contest rules. If you offer a winning prize to both the entrant and the friend, you’ll also get a new follower with a vested interest in the competition. The key element to focus on here is the quality of your audience, or how interested your audience is in your brand. The more you cultivate an audience to be engaged and excited by your brand, the better your long-term results will be. You’ll be more likely to organically increase your sales while potentially also adapting to your audience’s needs and desires. If you’ve decided to use your Instagram contest to build followers, that’s great! But if you’re more interested in associating a clear ROI to the contest, you need to connect it to sales. Think of this whole process like an email campaign. New subscribers to your Instagram page are just like new subscribers to any of your brand’s channels – they’re demonstrating intent. If you’ve run a great contest, you’ll have built a list of engaged, interested fans, both new and old. That means your Instagram contest is really just the start of a deeper sales campaign. You have several major pieces in place to turn the contest into a sales campaign. You have a list of interested people, most of whom didn’t win anything in your contest. If several thousand people entered your contest and only a handful won prizes, the overwhelming majority of entrants still want your prize or related products. So, how can you reach these people post-contest? You should find a place in your contest process to encourage your contestants to opt-in to an email list. This could be structured as an entry rule or as a bonus for extra votes. MVMT, for example, sent Instagram contestants to an external sign up page with an email opt-in form. I know what you’re thinking – they must have lost a lot of users by sending them away from the contest page. You’re probably right. Good news – that tool exists! Chatbots can do a lot more than just chat. A sales-focused bot like jumper is designed to manage a sales process, responding to intent and walking customers through checkout and follow up. If you set up the jumper chatbot on your Instagram page, you can run part of the contest through the bot and gather email addresses. This way, the chatbot will allow you to connect that ready-to-buy list with the products from your contest. Chatbots are more than just data gathering tools, though. By installing a bot like jumper across your brand’s social media pages, you’ll be able to follow up with your audience on different platforms. Email is a highly effective channel, but what if you could take advantage of Facebook Messenger’s much higher open rates? And what if you could automate the cross-channel marketing and sales? If you’ve never run an Instagram contest, now’s the best time to start. Choose the goal that’s best suited to your brand. Do you want to build a following? Are you launching a new product? Once you’ve created a stunning graphic, clear entry instructions, and a creative way to engage your contestants, don’t just sit back and watch. Promote your contest across all your brand’s social channels. Tweet, post, and include a contest link in your various bios. Periodically engage with your contestants in the post’s comments – it’s another chance for you to connect with your audience and give them a great experience. If you really want to take your contest to the next level, you need to think about sales. You’re creating a targeted list of people who want your product – don’t just disappear once the contest is over. The best way to handle sales is through a specialized chatbot like jumper. It’ll manage your page 24/7 and deal with contest-related spikes in page traffic. More importantly, jumper can play that vital role between people and product by gathering your contestants’ contact info and following up periodically across different social platforms. It’s an exciting prospect for brands operating online, as ecommerce is finally becoming omnichannel.